One person who speaks freely of this problem is author Amy Tan. She has posted on her author web site a long story about how she believes she may have been infected, and they many problems she has experienced over the course of her illness. At one point her problems was thought to be Multiple Sclerosis..so she was tested for that. She had suffered some very scary issues with depression, anxiety,hallucinations, and periods of aches and pains. She even felt that some medical personnel thought her to be a hypochondriac, or even worse, psychotic. Finally after a long period of ups and downs, she has some quality of life back thanks to stumbling upon a good treatment regimen. You can read her story here. Then there is the story of Sally Jones, which I found in the National Pain Report. Sally's story is similar to that of Amy Tan's because she is really uncertain about when her infection came into being. But as of the time of her writing, she was still suffering greatly. She says she is in unbearable pain much of the time. She speaks of her difficulties with chronic pain medications...how she can't really take them orally, how she can't really function without them. And that is really a shame. I hope for her that one day there will be better treatment options that don't pose such a high risk of addiction. 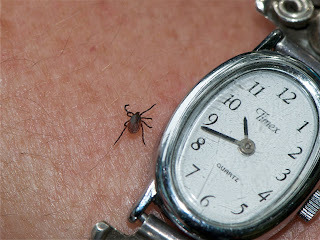 Maybe even a cure for Lyme disease will be found.You can read Sally's story here. Sadly, there are too many other people out there...some with stories on the web, and some not...who are suffering for life from this dreadful problem. There's not a 100% guarantee that all tick bites can be prevented, discovered, or eradicated..in the meantime, we have awareness of what Lyme disease is, what it does, and what we can best do to prevent the long term problems it can cause.